are suitable for the most demanding applications. We guarantee that under normal use, the leading edge will not dislodge, wear away or deteriorate over the life of the product. Our carborundum modified safety stair nosings are design to meet the requirements of AS1428.4 and are available in a range of high visibility colours including yellow, grey and black to provide a safe environment both inside and outside. Designed and manufactured from galvanised metal, carborundum and epoxy to provide maximum durability and safety. Also available in aluminium and stainless steel. Can be retro-fitted onto concrete, ceramic tiles, timber, carpet (direct stick) and almost any other surface. It is a legal requirement that stair tread nosings have a minimum of 30% luminance contrast to the stair tread. This stipulations reduces the chance of a mis-step which may lead to a fall either up or down the stairs. 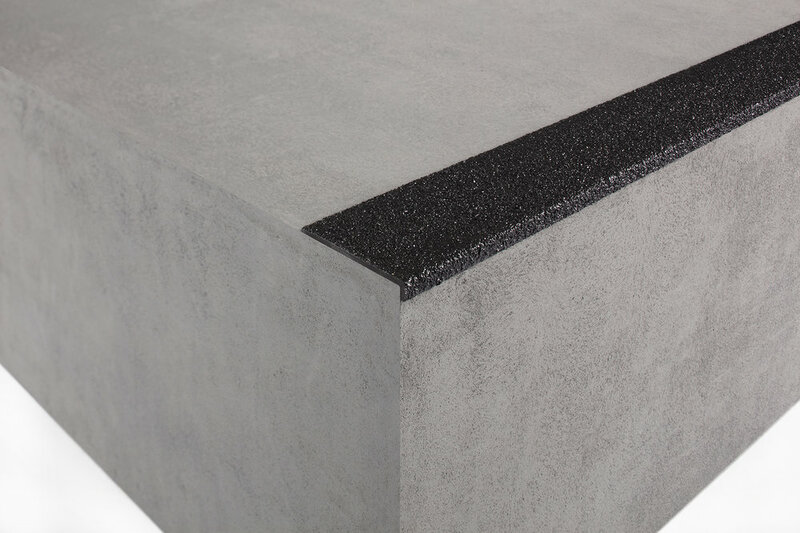 Grip Guard Carborundum Stair Nosings come in standard colours of black, yellow and grey. Additional colours are available on request. In accordance with the Australian Standards a minimum luminance contrast of 30% must be provided between the Safety Stair Tread and/or Plate and the surrounding substrate. Grip Guard’s Safety Stair Treads and Plates are available in 3 primary colours which allow specifier’s to select the most appropriate luminance contrast for any given application and aesthetic requirement. Refer to Grip Guard’s Safety Stair Treads and Plates luminance chart for selection details.